This is a very common question and one that is often misunderstood. The short and to the point answer, is NO, an electric toothbrush does not cause damage to the teeth or the enamel (under normal circumstances). If you want to know more and understand why they do not cause damage and how it is believed that they do, then read on. This question of the electric toothbrush doing damage to the teeth is similar and in fact linked to the question of “do electric toothbrushes cause gum recession?” Which we have already answered on our site. The resulting answer is essentially the same. The electric toothbrush does not cause damage to the teeth or to the gums, with many studies in fact showing how overall the electric toothbrush is better for the teeth and gums. A study by Annette Weigand in 2012 actually compared manual and electric brushes and found that manual brushes were more abrasive to the teeth and gums. 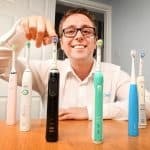 Cochrane also conducted research that demonstrated the benefits of electric toothbrushes, showing up to a 21% improvement in the resulting oral health. The reality is that in the western world there is a lot of research going on as well as a large number of different bodies within the dental and healthcare industry that would step in and issue appropriate advice if an electric toothbrush was so damaging. The story in the Daily Mail tells the tale of Natasha who ended up with receding gums as a result of using an electric toothbrush. 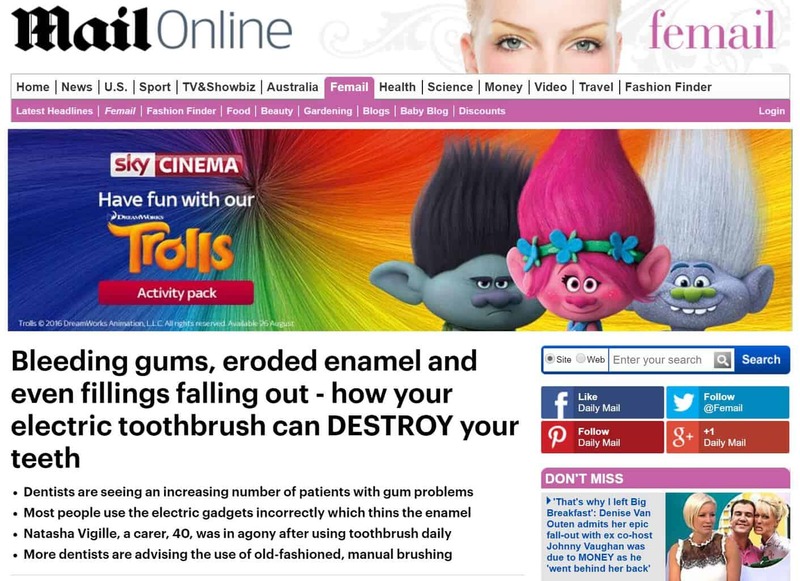 Now it was not obvious, until you read on, that the conclusion to the article was Natasha was likely over-brushing and using the wrong technique, as a result damaging her teeth and gums. The toothbrush was doing what it was supposed to but user/human error was really what led to the gum recession in this instance. She was brushing too often and using too much force or pressure as she did. Dentists agree that over brushing or brushing too hard will damage the teeth and gums if continued for long periods of time. A couple of weeks over-brushing is not a big issue, but go months or years and yes it will appear as if the electric toothbrush is responsible for the damage to the mouth. You might now see the link between the question of electric toothbrushes and gum recession. Professor Addy’s 2003 study concluded “There is no evidence to indicate that electric and manual toothbrushes differ in effects on soft and hard tissues. It is only under, over or abusive use or when combined with erosion that significant harm may be thus caused. In normal use it must be concluded that the benefits of tooth brushing far out-way the potential harm”. An electric toothbrush need only skim the surface of the teeth, it does a lot of the hard work, you don’t have to. You actually need a different technique to a manual toothbrush. We explain the right technique in our guide how to clean your teeth properly. Many modern brushes are equipped with pressure sensors that alert you when you are brushing too hard and the more capable brushes do now have apps that work on your smartphone to give real time feedback on the clean and how you can improve, telling you where you are getting right and wrong to ensure long term you have good oral health. For a more detailed look at these features, see our toothbrush buying guide post. The choice of whether you use an electric toothbrush or not is yours. A manual brush is perfectly adequate, but there are some benefits to an electric toothbrush. More important than manual or electric is regular brushing with the right technique and a good toothpaste, not to mention at least an annual checkup with a dentist. Toothbrushes that have removable/user replaceable batteries like you mention tend not to be quite as powerful as those with batteries built in. What I mean by this is that the number of times the bristles on the brush head move, is less per minute. However, these tend to still be significantly more powerful than using a manual brush. This therefore explains why the brush may feel a little more gentle on your sensitive gums, but still give a more effective clean than a manual brush. I agree with all that you say. In brushing, technique is everything, and I personally believe it is better to brush without paste or gel to get the best feedback from your mouth! Re electric, it is all too easy to brush too long, overall or in patches, and cause damage, hence best avoided, IMO. Re mouthwash, I am ambivalent. While morning mouth is offensive, why is the smell of disinfectant less so? And don’t most mouthwashes destroy good as well as bad bacteria? Leave some work for the body! Why can i get pain from using in a hard way my toothbrush or dental tape or especially electric tootbrush when they are just plastics and i guess are softer than teeth enamel, why does it cause sensitive teeth nerves but not somehow enamel abrasion or does it cause enamel erosion in conjunction with certain extra polishing toothpastes or after an acidic meal? I read that dental tape is coated with teflon, so i wonder if teflon is harder than enamel and can therefore abrade it? Brushing too hard can damage the enamel and cause sensitivity in the teeth and gums. Acidic products if then brushed into the teeth can theoretically speed up the erosion. If you hare finding particular pain when brushing or flossing, see your dentist for advice as they can look at your particular issue and advise.